We came across a brief review (in Catalan) of the winery of Oliver Conti up in Northeastern Catalonia, Spain. The writeup is overall quite positive, extolling the virtues of the Conti wines as well as the ecotourism that they ply, allowing people to stay amongst the vines in a rural setting. On the evening we visited in June, the northern, “tramuntana” wind blew. The vines bowed from this wind which took the words of our conversation towards the far off Montgrí. While poetic, that wind is damnable and strong all year round. 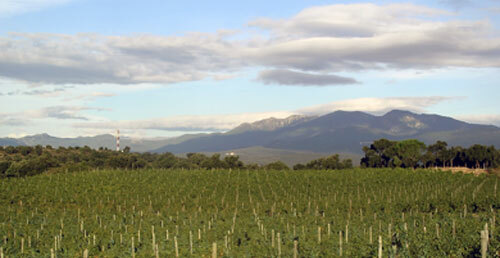 It gives a distinct element to the wines from Capmany though as, despite their somewhat higher altitude in Alt Empordà, they produce quite full-bodied vintages. The Conti wines follow true to the general theme of wines from this area in that they offer quite a good value for their price. While there are other wines that may be a bit more affordable, their entire line is noteworthy. Take for instance the 2008 Ara (which means “now” in Catalan). This is a great example of a wine that has been oaked, yet has wonderfully dark fruit with strong tannins that make it splendid to have with meals. Conti is also interesting in that they produce Sauvignon Blanc and Gewürztraminer whites, which for the area are rather rare. The Conti wines are quite easy to find and for those who pop to Figueres for whatever reason, you can pick them up at any of the local wine shops, which while not as satisfying as visiting the winery, is a great deal easier. Thanks for linking to my article and congratulations for your site.